PDF of Map Google Earth Need help with this map? 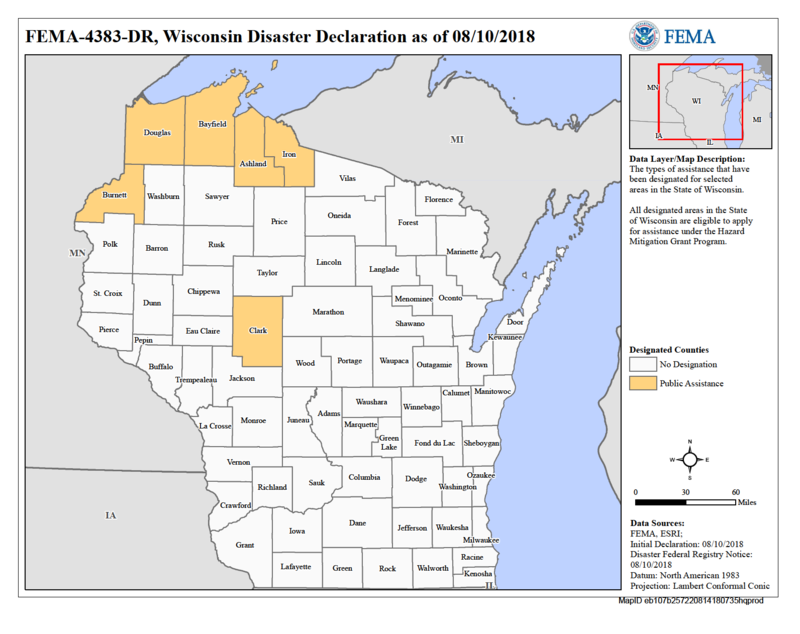 On August 10, 2018, a Major Disaster Declaration was issued for Ashland, Bayfield, Burnett, Clark, Douglas and Iron counties, triggering the release of Federal funds to help communities recover from the severe storms, flooding, landslides, and mudslides that occurred June 15-19, 2018. The Public Assistance Program provides grants to state and local governments and certain nonprofit entities to assist them with the response to and recovery from disasters. Specifically, the program provides assistance for debris removal, emergency protective measures, and permanent restoration of infrastructure. Eligible applicants include state governments, local governments and any other political subdivision of the state and Native American tribes. Certain private non-profit (PNP) organizations may also receive assistance. Eligible PNPs include educational, utility, emergency, medical, temporary or permanent custodial care facilities (including those for the aged and disabled), irrigation, museums, zoos, community centers, libraries, homeless shelters, senior citizen centers, rehabilitation, shelter workshops and health and safety services and other PNP facilities that provide essential services of a governmental nature to the general public. PNPs that provide "critical services" (power, water - including water provided by an irrigation organization or facility, sewer, wastewater treatment, communications and emergency medical care) may apply directly to FEMA for a disaster grant. All other PNPs must first apply to the Small Business Administration (SBA) for a disaster loan. If the PNP is declined for a SBA loan or the loan does not cover all eligible damages, the applicant may reapply for FEMA assistance. As soon as practicable after the declaration, the grantee (state or tribe), assisted by FEMA, conducts the Applicant Briefings for state, local and PNP officials to inform them of the assistance available and how to apply for it. A Request for Public Assistance must be filed with the state or tribe within 30 days after the area is designated eligible for assistance. Following the Applicant's Briefing, a Kickoff Meeting is conducted where damages will be discussed, needs assessed, and a plan of action put in place. A combined federal/state/tribal/local team proceeds with Project Formulation, which is the process of documenting the eligible facility, the eligible work, and the eligible cost for fixing the damages to every public or PNP facility identified by State, tribal, or local representatives. The team prepares a Project Worksheet (PW) for each project. If and when individual assistance money is approved for this disaster, it will be displayed here. Information is updated every 24 hours. ✝ Dollars Obligated: Funds made available to the State via electronic transfer following FEMA's final review and approval of Public Assistance projects. Learn more about FEMA Disaster definitions. Information is updated every 24 hours.